Liberation & Love in London. Hearts bursting open. Tears flowing. 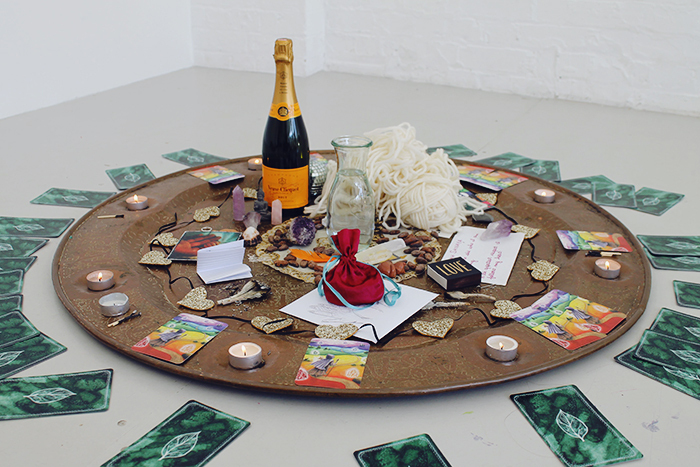 This was the experience of Saturday's Liberation & Love Urban Retreat. It was truly a deep dive out of the head and into the heart. And babes, let me tell you, it was transformative. Jayne had just came back from two months in Costa Rica and was able to share so many lessons, remedies, and rituals that she'd learned during her travels. It was an intimate, exclusive event, which allowed us to go so much further with this work than ever before. There were raw cacao elixirs. Embracing of the dark of the light. Uninhibited sharing and intimate healing. There were rose petals and grounding foods and homemade chocolate. Laughter and tears and new friendships. There was dancing and yoga and deep, deep relaxation. And of course there was a glittery goodie bag, filled with treats from our wonderful sponsors: Nikki Strange, Sparkle Child London, Indigo Herbs, Ombar Chocolate, Napiers, Teapigs, and Signature Fragrances. I came away with the a strong understanding that we crave this. We crave time in the circle with other women. We long for open and honest conversations. We want to be together creating deep connections. Workshops and retreats are a great way to facilitate and create space for this and take things to an intimate place more quickly than in every day life. But it shouldn't stop there. We need our sisters and we need to create spaces to connect with them. Blogging is a great way to find your tribe and make friends all over the world, but there's something so important about tangible, face-to-face interactions. Personally I've felt called to organise monthly, lady date brunches with my girl gang and I can't stop thinking about other ways to bring the circle into my everyday. Coffee dates. Mastermind groups. Skype calls. Dance parties. Book clubs. Sleepovers. Regularity and consistency is key. Make it a ritual. Give it a purpose. Keep it fun. When we allow ourselves to be raw and real with each other, we all heal and expand and grow. I really hope to see you at one of my future events but if you're on the other side of the world or it's just not your cup of tea, reach out to the women in your life. We all want this. Be the one to alight the spark. Newer PostDon't Let Someone Else Create the Yard Stick for Your Life. Older PostInspiration Interview: Sarah Von Bargen from Yes & Yes.